Few in Aachen could have doubted that the end was near when on 10 October three Americans—1st Lt. Cedric A. Lafley, 1st Lt. William Boehme, and Pfc. Ken Kading—approached along the Trierer Strasse bearing a white flag and a surrender ultimatum. As most were to learn from listening to Radio Luxembourg or to American public address systems, or else from examining leaflets which American artillery shot into the ruins, the Americans were granting the commander of the Aachen military garrison twenty-four hours in which to surrender. The military commander of Aachen at the time of delivery of the surrender ultimatum was Colonel Leyherr, one of the 246th Division’s regimental commanders. Colonel Leyherr dutifully rejected the ultimatum in accord with "last stand"’ orders that had come from the Jovian pen of Hitler himself. free to assault the city. Within the inner defenses of Aachen, Colonel Wilck had roughly 5,000 men. Most were from Wilck’s own 246th Division, though some represented nondescript fortress units and 125 were Aachen policemen thrust into the line under command of the chief of police. Some eighty policemen from Cologne were later to slip through the gap at Wuerselen to join the fight. As Colonel Wilck must have known, the great American superiority was in armor, artillery, and planes. Although the Luftwaffe had begun to display recognition that a war still went on in the West, the German planes usually appeared only in small groups and at night when Allied aircraft were not around. As for armor, Colonel Wilck had no more than about five Mark IV tanks. As long as communications remained constant, Colonel Wilck might solicit substantial artillery support from outside the city; but at hand within the inner defenses were only 19 105-mm. howitzers, 8 75-mm- pieces, and 6 150-mm. guns. thrust, he could permit only a cautious advance because the gap at Wuerselen still was open and from Stolberg to Ravels Hill his defenses were dangerously thin. He told the 26th Infantry commander, Col. John F. R. Seitz, not to get inextricably involved in Aachen. The regiment would have to attack, as the 26th Infantry S-3 Put it, "with one eye cocked over their right shoulder." Yet in striking from the east defenses that until recently had been sited against assault from the west and south, the regiment held a distinct advantage. During the two days when the 18th Infantry was driving north through Verlautenheide to Ravels Hill, the 26th Infantry had been eating away at Aachen’s eastern suburb of Rothe Erde and otherwise getting into position for assault on the city. To reduce his frontage, Colonel Seitz put a provisional company into the line on his left wing to face Aachen from the southeast. This company tied in with defenses of the 1106th Engineers south of the city. Although the engineers were to pivot their right wing from time to time in order to maintain contact as the 26th Infantry advanced into the city, they were not equipped to make a full-blooded attack. Colonel Seitz pressed his 2d Battalion under Lt. Col. Derrill M. Daniel up to the Aachen-Cologne railroad tracks at Rothe Erde and prepared to send the battalion westward through the heart of Aachen. His remaining battalion, the 3d, under Lt. Col. John T. Corley, moved to jump-off positions north of Rothe Erde (between Rothe Erde and Haaren). From there Colonel Corley was to strike northwestward against a wilderness of factories lying between Aachen proper and Haaren and thence westward to seize three hills that dominate Aachen from the city’s northern fringes. The bulk of this hill mass, developed as a big public park, is known as the Lousberg. It rises to a height of 862 feet and casts a shadow over almost the entire city. The Americans were to know it as Observatory Hill after an observation tower on the crest. A lower knob on the southeastern slopes of the hill, crowned by a cathedral, is known as the Salvatorberg. Farther down the southeastern slopes in Farwick Park stands the elaborate Palast-Hotel Quellenhof and a municipal Kurhaus where, in happier days, patrons took the medicinal waters. Even as the air and artillery bombardment continued on 12 October, Colonel Corley’s 3d Battalion, 26th Infantry, attacked to clear the factories lying between Aachen and Haaren, a preliminary to the main attack set to begin the next day. Despite the urban nature of the battlefield, the battalion methodically cleared the objective and by nightfall was poised for the main assault. Early on 13 October Colonel Corley’s battalion was to push northwest toward Observatory Hill while Colonel Daniel’s 2d Battalion began a painstaking sweep through the heart of the city. 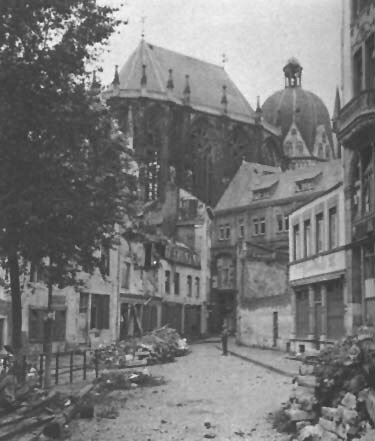 In moving through the center of Aachen, Colonel Daniel’s men not only had to plow through the maze of rubble and damaged buildings in their path but also to maintain contact with Colonel Corley’s main effort against the northern hills. His left (south) flank resting on the railroad, Colonel Daniel had an attack frontage of about 2,000 yards, no minor assignment in view of the density of the buildings. Of necessity, his advance would be slow and plodding. The fighting in Colonel Daniel’s sector quickly fell into a pattern. Dividing his resources into small assault teams, Colonel Daniel sent with each infantry platoon a tank or tank destroyer. These would keep each building under fire until the riflemen moved in to assault; thereupon, the armor would shift fire to the next house. Augmented by the battalion’s light and heavy machine guns firing up the streets, this shelling usually drove the Germans into the cellars where the infantry stormed them behind a barrage of hand grenades. Whenever the enemy proved particularly tenacious, the riflemen used the other weapons at their disposal, including demolitions and flame,, throwers employed by two-man teams "’ attached to each company headquarters. The men did not wait for actual targets to appear; each building, they assumed, was a nest of resistance until proved otherwise. Light artillery and mortar fire swept forward block by block several streets ahead of the infantry while heavier artillery pounded German communications farther to the rear. assigned a specific zone of advance; company commanders in turn generally designated a street to each platoon. After a few bitter experiences in which Germans bypassed in cellars or storm sewers emerged in rear of the attackers, the riflemen soon learned that speed was less important than pertinacity. The sewers posed a special problem; each manhole had to be located and thoroughly blocked and covered. Another special problem stemmed from glass and other litter that punctured tires on jeeps used for evacuating wounded. Medics found a solution in weasels (M-29), tracked, lightly armored cargo carriers. In the other half of the attack, Colonel Corley’s battalion, which was driving west toward the high ground marked by the Lousberg (Observatory Hill), the Salvatorberg, and Farwick Park, found the route blocked on the first day, 13 October, by stoutly defended apartment houses. The men measured their gains in buildings, floors, and even rooms. Someone said the fight was "from attic to attic and from sewer to sewer." By nightfall of the first day Colonel Corley’s battalion had reached the base of the high ground. Early on 14 October, when two companies combined to overrun a strongpoint at St. Elizabeth’s Church, the momentum of the attack carried one of the companies a few hundred yards past the church and into Farwick Park, the big park surrounding the Kurhaus and Palast-Hotel Quellenhof. Yet this company’s hold was tenuous at best, for the rest of the battalion still was occupied in the buildings on the approaches to the park. The Germans still held the buildings in Farwick Park: the hotel, the Kurhaus, a greenhouse (Orangerie), and several gardening buildings. As early as 13 October, the drive toward the high ground had prompted the enemy commander, Colonel Wilck, to appeal for reinforcements. By nightfall, in response to this plea, the Germans on Observatory Hill were strengthened with about 150 men who were all that remained of Wilck’s own 404th Regiment. Although Kampfgruppe Diefenthal’s SS-Battalion Rink also tried to reach the hill, that battalion was sidetracked by one of the 30th Division’s attacks near Wuerselen. Colonel Wilck radioed his corps commander, in what was apparently a gross exaggeration, that American tanks had surrounded his command post in Hotel Quellenhof. sturdy walls of Hotel Quellenhof. Colonel Corley was sending forward his 155-mm. rifle to blast the building and readying his reserve company to flank it when the Germans launched a sharp counterattack. In strength of about one battalion, the counterattacking force apparently included remnants of both the 404th Regiment and SS-Battalion Rink. For about an hour the American company on the north edge of Farwick Park parried the blows, but at last the company had to fall back. Supported by assault guns, the Germans swept southward to hit the next company. Although forced to relinquish the Kurhaus, the company held fast in the park surrounding it. Refusing to leave his post, a mortar observer called down shellfire on his own position. By 1700 the sting was gone from the German drive. Colonel Corley could report that his men not only would hold their own but soon would resume the advance. 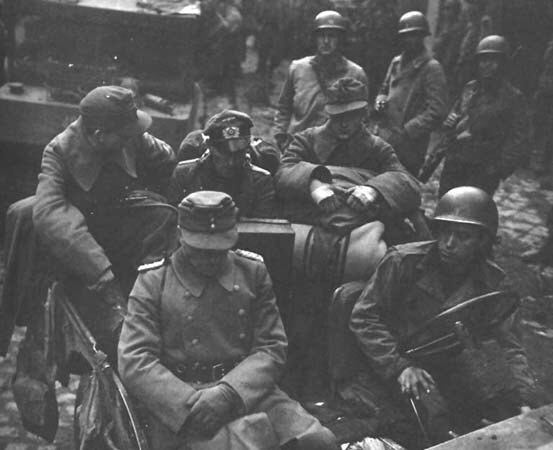 The battalion did hold, but in light of the bludgeoning blows which the 3d Panzer Grenadier Division had begun to direct against the 16th Infantry’s linear defense near Eilendorf, General Huebner directed postponement of further offensive moves in Aachen. He told Colonel Seitz to hold in place until the situation along the division’s east wing could be stabilized. Only for a day was it necessary for the two battalions in Aachen to desist from attack. By 16 October the 16th Infantry had repulsed the best the 3d Panzer Grenadier Division could offer. The long-awaited juncture between 1st and 30th Division troops to close the Wuerselen gap in the Aachen encirclement further allayed General Huebner’s concern. Yet General Huebner still was to hold the 26th Infantry in check for another day while awaiting arrival of reinforcements promised for the final blow against Aachen by the corps commander, General Collins. In the meantime troops of both the 1st and 30th Divisions in the vicinity of Ravels Hill and Wuerselen fought to make a firm link from the tenuous patrol contact which Privates Whitis and Krauss had established between the two divisions late on 16 October. To prove their accomplishment no fluke, Whitis and Krauss led a patrol from the 18th Infantry to 30th Division positions on Hill 194 that night; yet German attempts to reopen a route into Aachen would deny genuine adhesion in the last link of the Aachen circle for several days. A company of the separate 99th Infantry Battalion (attached to the 116th Infantry) discovered this fact early when German forays during the night of 16 October seriously contested a roadblock which the infantry company established across the Aachen-Wuerselen highway.8 It was obvious that so long as the enemy’s 3d Panzer Grenadier and 116th Panzer Divisions remained in this sector, a major counterattack to break the encirclement was a logical expectation. The XIX Corps G-2 fed the apprehension by continuing to express concern over the whereabouts of the 9th Panzer Division. Engineers south of the city.13 On 18 October as these new units moved into position, General Huebner authorized the 26th Infantry to renew the assault. In Farwick Park, Colonel Corley’s battalion set out to regain the ground lost there three days before, pass on to the Salvatorberg, and assist Task Force Hogan’s drive on the Lousberg. One platoon rapidly recaptured the Kurhaus. While the enemy cowered in the basement of Hotel Quellenhof to escape American shelling, another platoon under 2d Lt. William D. Ratchford stormed into the hotel lobby. Hand grenade duels developed at every entrance to the basement. By the time Lieutenant Ratchford had procured machine guns to fire into the basement, the Germans had had enough. Twenty-five of the enemy had died in the fighting. A search of the hotel revealed large caches of food and ammunition and on the second floor a 20-mm. antiaircraft gun which the Germans had carted upstairs piece by piece, reassembled, and sited to fire into the park. The defenders of Aachen will prepare for their last battle. Constricted to the smallest possible space, we shall fight to the last man, the last shell, the last bullet, in accordance with the Fuehrer’s orders. In the face of the contemptible, despicable treason committed by certain individuals, I expect each and every defender of the venerable Imperial City of Aachen to do his duty to the end, in fulfillment of our Oath to the Flag. I expect courage and determination to hold out. dential sectors. 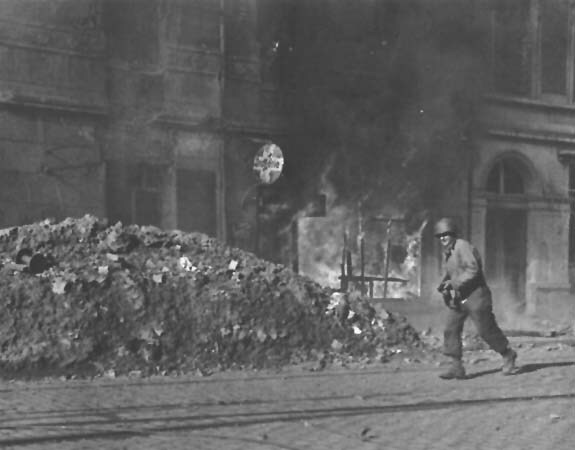 After collapse of a strongpoint in the Technical University in the northwestern corner of the city, the battalion reached the western railroad tracks as night came on 20 October. 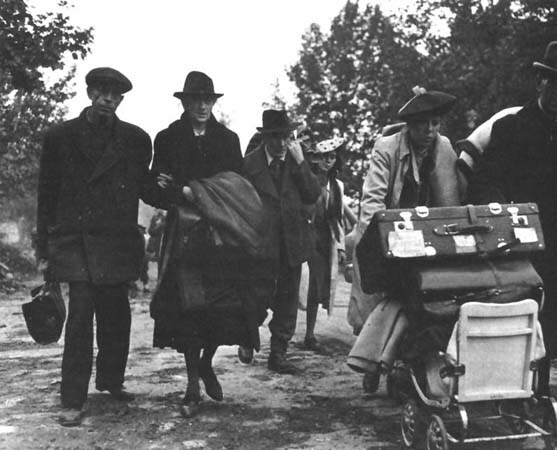 The few Germans remaining were corralled in the western and southwestern suburbs. 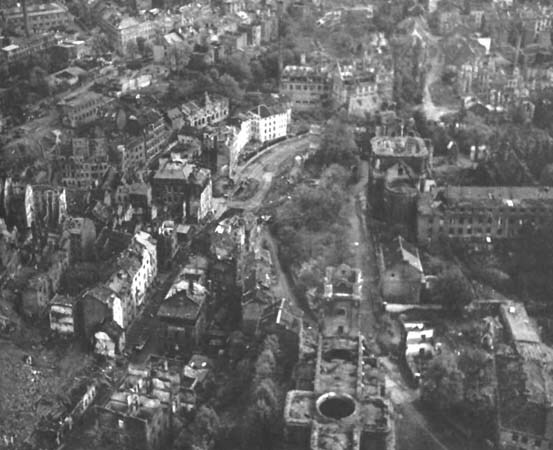 On 21 October, Colonel Corley’s battalion approached a big air-raid bunker at the northern end of Lousberg Strasse. Colonel Corley called for his attached 155-mm. rifle. To the attackers, this was just another building that had to be reduced. They had no way of knowing that here was the cerebellum of the Aachen defense, the headquarters of Colonel Wilck. From this bunker, Colonel Wilck and his staff had been exercising their penchant for the melodramatic. "All forces are committed in the final struggle!" "Confined to the smallest area, the last defenders of Aachen are embroiled in their final battle!" "The last defenders of Aachen, mindful of their beloved German homeland, with firm confidence in our final victory, donate Reichsmark 10,468.00 to the Winterhilfswerk [Winter Relief] Project. We shall fight on. Long live the Fuehrer!" Such was the tenor of Colonel Wilck’s last messages to his superiors on the outside. As Colonel Corley called for his 155-mm. rifle, Colonel Wilck, despite his exhortations, was ready to end the fight. But how to surrender? Two Germans who had tried to leave the bunker under a white flag had been shot down in the confusion of the battle. The solution appeared to lie among some thirty American prisoners the Germans were holding. From the prisoners they solicited volunteers to arrange the surrender. Two men from the 1106th Engineers who had been captured early in the Aachen fighting responded. They were S. Sgt. Ewart M. Padgett and Pfc. James B. Haswell. While Colonel Wilck by radio renewed his "unshakable faith in our right and our victory" and again paid obeisance to the Fuehrer, Haswell and Padgett stepped from the bunker. Small arms fire cracked about them. Bearing a white flag, the two men dashed into the middle of Lousberg Strasse. As they waved the flag frantically, the firing died down. An American rifleman leaned from a nearby window to motion the two men forward. Sergeant Padgett beckoned to two German officers behind him to follow. COLONEL WILCK and his headquarters group after their surrender. Lafley and Boehme had delivered the surrender ultimatum eleven days earlier. The battle of Aachen was over. Though the Germans had failed to prevent encirclement and had held out within the city only five days after encirclement, the true measure of the battle from their standpoint was that they had imposed a telling, though costly, delay. The 30th Division listed 6,000 prisoners and the 1st Division another 5,637, including 3,473 taken within the city.18 The way in which German units were squandered without major reward was indicated by the fact that an equivalent of twenty battalions had been used in counterattack roles against the 30th Division, yet in only one or two cases had any counterattack involved more than two reinforced infantry battalions. A never-ending compulsion to stave off recurring crises had sucked the enemy’s units into the abyss of piecemeal commitment. AACHEN MUNSTER, popularly known as the Charlemagne Cathedral. A paradox of the battle, particularly in the sector of the 30th Division, was that it had involved primarily infantry units, yet it had assumed the complexion of an armored duel. Both sides had tank support, and few units, German or American, had experienced much success unless supporting tanks were on hand. By their own count, the Germans lost 45 tanks.20 In one two-day period (9-10 October) the 30th Division claimed 20 German tanks: 12 destroyed by 105-mm. howitzers, 5 by supporting tanks and tank destroyers, and 3 by bazookas. you on the 20th and 21st of October." The Germans were only one day off. At noon on 22 October, General Simpson’s Ninth Army headquarters moved from Luxembourg to assume control of the XIX Corps. The boundary between the First and Ninth Armies was to follow the existing boundary between the VII and XIX Corps. If this was the case, it was diametrically opposite to General Eisenhower’s view as expressed in a letter to the Chief of Staff, General Marshall, dated 20 October 1944. Eisenhower wrote that he was relieving Corlett to send him home for sixty days "for physical check-up and rest. He has performed most effectively throughout the campaign . . . . I should like for him to get a chance for real recreation and then return here sometime within the allotted period. I regard him as an outstanding corps commander." Eisenhower to Marshall, S-63258, Pogue files. See also, Corlett to OCMH, 2 Sep 53, and 20 May 56. Give me five years and you will not recognize Germany again.